This was a special day, a visit to a school in the countryside. The children here are from the families of poor farmers. The school was located in lovely countryside but the school itself was in a poor condition. My Chinese friend Wang Li Juan, English name Summer, took some books from her school and the kids were delighted to receive them. I think there was less than a hundred kids at this school, so much smaller than the city schools. After the visit to the school we were taken to an amazing cave. The countryside here is stunning. Here is a video slide show I made of the visit. With the job situation so bad in the UK, many people are looking outside of the country to seek employment. Some are considering teaching English abroad as an option and some might even look as far as China for work. In this article I want to pass on some information and a little advice about working as a teacher in China and what you can expect from a life here. You will need to have a teaching certificate in teaching English and this comes in the form of a TEFL certificate – Teaching English as a Foreign Language. However, you are not going to get a good job with just that; for many teaching positions here you will need a degree, especially for jobs in the big cities like Shanghai and Beijing. Of course if you are already a teacher, then it will be much easier for you. It is possible to find teaching posts with just a TEFL but they will be in lesser schools in the main cities or in schools in other smaller cities. There are many courses you can take to gain a TEFL certificate and many online courses too. I took an online course from a company called i-to-i; it was 120 hours. However I wasn’t impressed with the course. Firstly I found that it didn’t really teach me much about teaching and secondly I didn’t consider the online tutor to be that helpful. My wife Crystal however, who is Chinese and a qualified English teacher, took at the same time an ITTT International course. She thought it might come be useful one day, especially if were to go to Europe. The ITTT course was more expensive than mine and it turned out to be much better. She learnt the subject in greater depth and had better support from her online tutor. A word of warning however about TEFL courses; if your knowledge of grammar is shaky, you will either need some help or will need to embark on some further study. I have to confess that my knowledge of English grammar was very poor indeed and ironically it was my Chinese wife who was able to help me through the course. It does seem amazing that one can speak, read and write reasonably well in English and yet have a poor knowledge as to how one’s own language works. I guess you could say we native speakers learn our language organically, whereas foreign students gain it in a more regimented way through text books and concentrated study. I can write better than my Chinese wife and of course speak better but she knows much more than me about pronouns, adjectives and passive voice etc. Teaching oral English however doesn’t rely on explaining grammar but it is advisable to know more than your students. If a student were to ask you a question to which you cannot answer, you are going to look pretty stupid! What’s more your students will happily tell their teachers about your apparent lack of knowledge. Many companies offer courses in the country where you are planning to teach. This of course is a good way to get an introduction to a country before you start teaching. However, a couple of teachers I met did their course in Beijing which is nothing like the small city they ended up in – Zunyi. Zunyi is where I have been teaching these past three years. Apparently they had a great time in Beijing, visiting the bars every evening and they got to see some of the great tourist attractions but financially their six months in China was a loser. The advantage of finding work through a TEFL organisation such as i to i is that they will surely find you work, however this comes at a price. You will have to pay a tidy sum for the overseas course and secondly you will not get paid the going rate at whatever school you end up at. There is also another disadvantage with this – you are not independent and will have to deal with two or more agencies if you encounter problems, which is sure to happen. You will also have to pay for your airfare to and from the UK which can amount to £800 or more by the time you include internal flights. Many schools however will pay for one return flight every year or pay a completion bonus of a similar amount. The lesson is – if you allow others to make all your arrangements, it will cost you a lot of money. If you have a degree and teaching experience, you’ll probably be able to get a good job in a university/college teaching whatever subject you are experienced in, for example English literature, economics etc.. Educational institutions often have specific names such as Zunyi Medical College but that doesn’t mean the only subjects they teach are medical; you will find here, students majoring in English and other subjects not related to medicine. The school I teach at is grandly called the Aerospace School but the only subject that could be remotely connected with this is a metalwork workshop; so don’t be put off by the name of the school. If you have a degree but don’t have teaching experience you can still find a reasonably well paid job but you will only be expected to teach oral English. Chinese English teachers reach a very high standard in grammar, probably higher than most folk in the UK; therefore it is unlikely you will be asked to teach it. What’s more, you need to speak Chinese in order to explain the grammar rules clearly and it is impossible to do so without speaking Chinese. If you don’t have a TEFL certificate but not a degree you can still find a job teaching oral English in either a middle school, junior school or kindergarten but your salary will be lower. 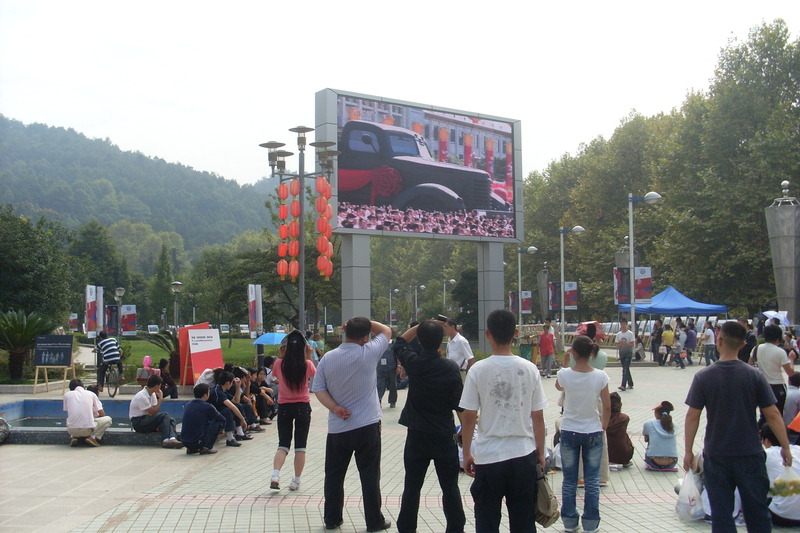 In china there are universities and colleges which are basically the same thing; senior middle schools (students 15-18 years), junior middle schools (students 12 -15 years), primary schools (6 – 12) and kindergarten (aged 3 – 6, although some children start much younger) and all will teach English as part of their curriculum. Some kindergarten in the big cities will employ native English teachers but of course these are very informal classes and you should have a Chinese classroom assistant to help you. Don’t expect a Chinese assistant in schools for older students. Some schools are privately owned and some are state run. My school was previously state run but is now privately owned. Whatever school you teach at in China, you’re not going to make a lot of money. However, you can have a comfortable life here because generally the cost of living is much lower. In the bigger cities, someone with a degree and perhaps a background in teaching can earn around 12,000 rmb a month which currently is about £1,200. However other teaching jobs in the big cities start at around 8000 rmb. If you go to one of the smaller cities you can expect to earn a lot less but it depends on what type of school you teach at. At a private English language school which teaches mainly at weekends and evenings, you will earn more than at middle or junior school. So many students take extra classes at the weekend or in the evening and their parents have to pay extra for this. At a large and successful privately owned English school in Zunyi, the teachers get around 8000 rmb which is a very good salary here. In contrast, at a state owned middle school, the teachers there earn a mere 2500 but there is a good reason for this difference. 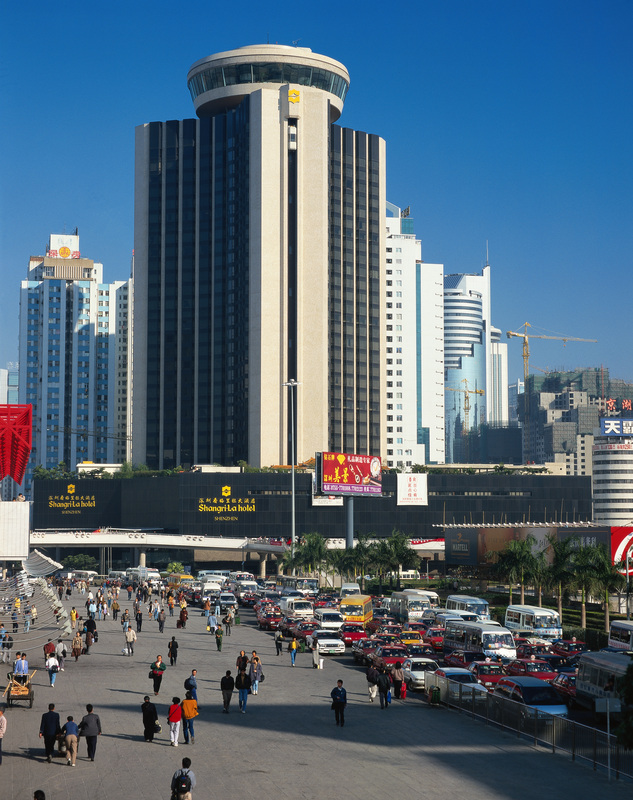 The two teachers who work there gained their qualification in Beijing through i to i, prior to coming to this city. The school will be paying a lot more for their services because they will also be paying the TEFL organisation and agents. So as you can see, salaries can vary greatly. Many schools will offer accommodation as part of the package and of course accommodation will vary greatly. I am very fortunate, I have a lovely apartment with two bedrooms, a living room, dining room, kitchen, shower room with western loo, TV DVD and computer, and the rent/electricity is paid for by my school. However the teachers I referred to earlier have a single room in an office building within the school complex, and the shower room with squatting toilet they have to share with other members of staff. What makes their accommodation even worse is that the school imposed an eleven o’clock curfew for them to be in during the week and the school bell was outside the door and even at weekends they had no rest from it. Do try and find out what sort of accommodation you will get in advance of coming. Having said that, if you come with an agency it’s going to pretty difficult to find out any concrete information in advance. Bear in mind that some schools will not pay for your accommodation and you will have to find it yourself and of course you will need help with this. Last year (2009), I made enquiries through an agent to get a teaching job in Shenzhen. The salary I was offered was 8000 rmb which is nearly twice as much as much as I get now. The agent also offered me a small room in a shared apartment with three other people (teahers) and the price for this one room was 1700 rmb. So with higher costs of food and travel, I would have been no better off and my living accommodation would have been much worse – I declined the offer. Like any country, the cost of living varies greatly between city and provincial areas. Salaries are higher but so too are living costs in a big city. I can’t give you prices of things in other cities but I can give you some relative examples from the city I live in. A simple meal based around rice or noodles will cost 5 rmb (50p) whereas a decent meal for four people at a simple restaurant will cost 60 – 100 and at an expensive restaurant, 200 – 300. Taxi fares start at 5 rmb for quite a long distance and all bus fares in the city are 1 rmb. So although my salary is low, I can live very cheaply indeed. In fact because I spend so little and don’t use a credit card or have a loan to pay, this is the first time in my life that I could actually save money on a regular basis. It is wonderful to have no debt and no worries about money. The Chinese government strictly controls what people can view on the Internet, especially adult sites. At the time of writing you can’t use Facebook and YouTube, and much to my annoyance even BlogSpot is blocked. I created a lovely blog about Chinese tea and now I can’t use it. If you can’t live without Facebook or YouTube then don’t come to China. In the bigger cities, you can dine on a wide variety of western foods but expect to pay much more for this. If you are a western fast food fan, you’ll find more outlets than you can shake a stick at in the bigger cities but in the smaller cities you won’t find many. In my city there are three KFCs and that’s all. Large cities will have supermarkets like Walmart and Carrefour and even in Zunyi there are two Walmarts, which sell a small selection of western foods. In the big cities you will find all the entertainment you could hope for and of course western bars selling western beers and spirits but expect to pay high prices for these. 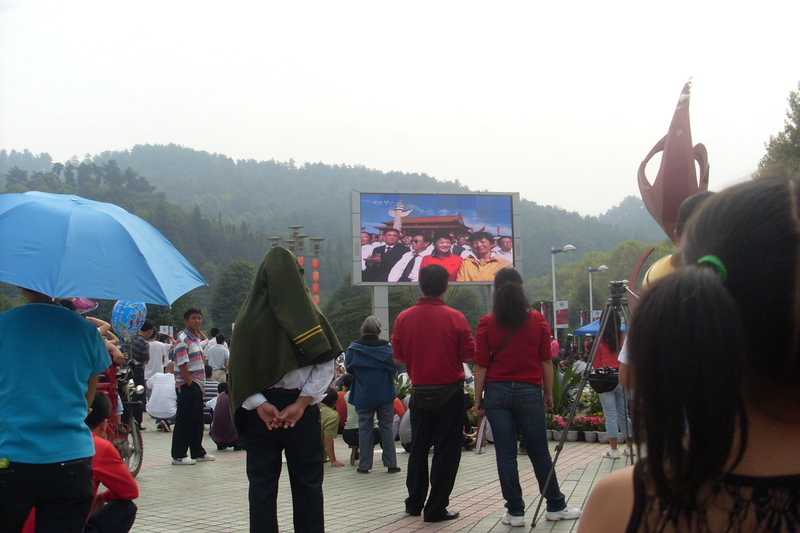 In smaller cities like Zunyi, you’ll be lucky to find any. Don’t expect everyone in Beijing or Shanghai to speak English because although every student in China will learn some English, most will not use it and forget it. Today English is the second language taught at schools but forty years ago it was Russian. Also most of the signs will generally only be in Chinese. This can be especially difficult if you want to catch a local bus. If you want to be independent, and you may well have to be, you will have to try and learn some Chinese. However, every city and region has its own dialect. The national language is mandarin and is taught in all schools but different dialects are spoken in every city. Don’t expect to learn mandarin and then understand a conversation in Shanghai because there they speak Shanhaiese. 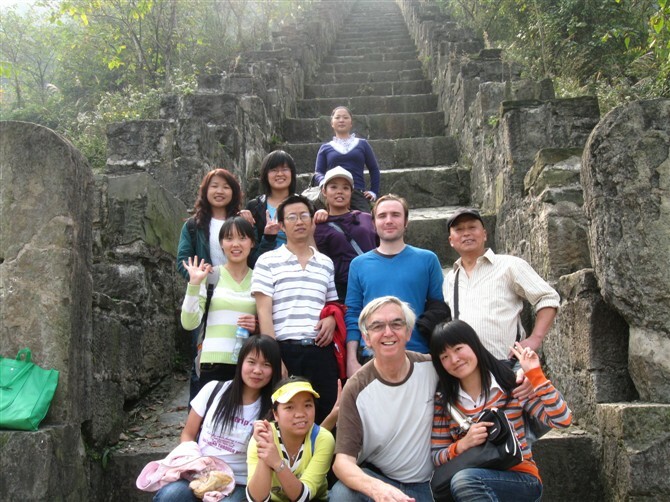 Cultural differences: Cultural differences: See my article Culture Shock – A westerner living in China. If you want to come and live and work in China, my advice is put aside your thoughts of home and accept life as it is here. 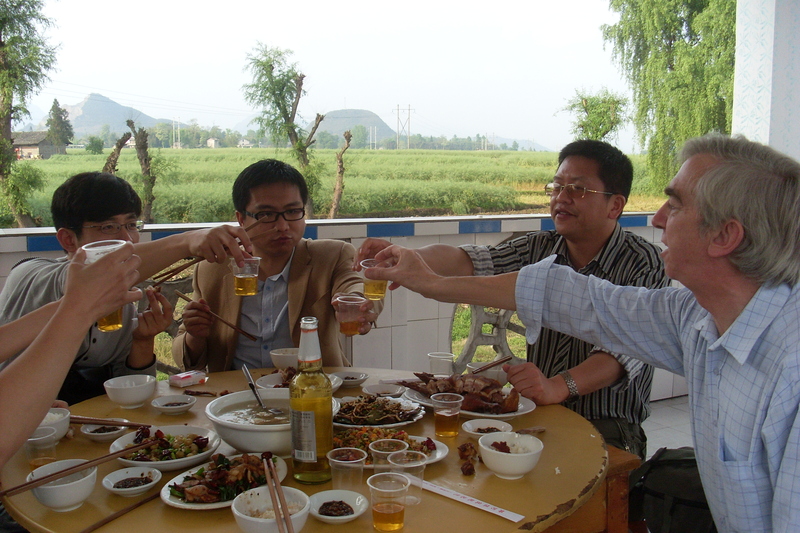 Don’t compare life at home with life in China; if you do you’ll only get deeply frustrated and want to go home. Life in China can drive you up the wall at times but there are many wonderful aspects about living here also which may not at first be apparent. You need to take your time in settling in and it may take you a long time to begin to feel comfortable here. Once you get to know the people you will find them warm and generous and their culture has so much to offer. Who knows, you might even want to settle in China! 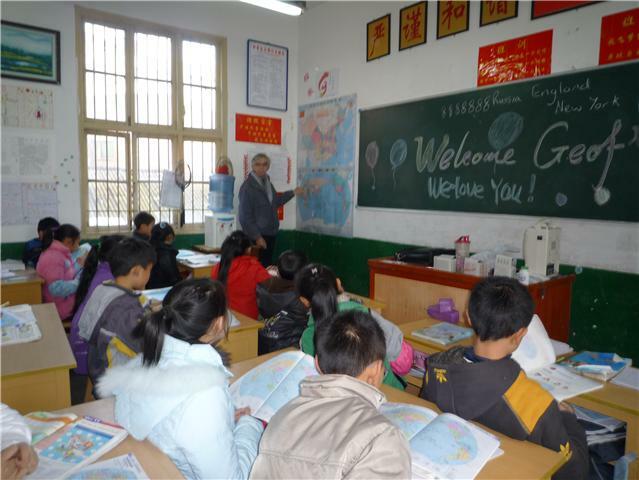 There are so many things to consider before you accept a job as an English teacher in China, too much to write about here – read my other articles in my blog for more information about life in China. I had not been a teacher before – well not like this – so this was a totally new experience for me but one I did not feel uncomfortable with. I generally feel comfortable working with people and teaching oral English gave me a real outlet for my creativity, something previous jobs had never done. However it was a little daunting in those first few days to see sixty-five expectant faces looking curiously at me; all trying to work out what I was saying but the welcome of the children was fantastic and this helped me soon to feel at ease. The start of any new job is always going to a difficult period, a time when you are settling into new routines and finding your feet, and the first few months for me were no different. The most difficult part however was for me to regulate my voice so the children had a chance of understanding me, and for them to get used to my voice. In the early days they probably understood very little but as time went by, they got much better at it and now I am constantly surprised about what they pick up on, often when I make a throwaway remark. However, I still use the practice of writing down my questions on the board and any other words or sentences I am dealing with; to add to this I will quite often ask students individually if they understand. I must admit, I don’t think I made a very good job of teaching in those early months because it was a period when I was finding out what worked and what didn’t. I made loads of mistakes but I always to tried analyse what I was doing in an effort improve my teaching. Of the many things I have come to know about teaching in a classroom with such large student numbers, is the number of students who will not be paying attention at any one time. There are the obvious ones who are playing with their mobile phones, doing their homework, reading books or looking at themselves in a mirror and then there are the few who see the classroom as an opportunity to sleep. To add to this number there the talkers, who are clearly not listening to you but conversing with their friends and then there are the less obvious ones, who are gazing into space and perhaps looking totally bored. These are the obvious non-listeners but there are also those who look like they are listening but are really away with their own thoughts. So the number who are actually listening at any one time can easily be less than half, especially for the low ability classes. The problem is that for many students, they either have no interest in oral English or find it so difficult to understand all of what is being said and therefore cannot keep up, and this can easily cause their mind to wander. Of the former there is really nothing that can be done, except to try to make the lessons as interesting as possible and hope that perhaps they take an interest. Regarding the latter group, those whose English ability is poor and so cannot keep up; this is a difficult problem for the teacher. It is not possible to pace the lesson for the sake of the slowest, nor is it good to pace it for the brightest; the answer is to find a level which is somewhere in the middle but it can be difficult to know exactly where is the middle. The certain thing is, as an English teacher in junior or middle school; you are never going to capture the attention or interest of all, especially with such large numbers. What’s more in the situation where there is only one forty-five minutes session a week for each class, you have little chance of really helping them improve their spoken English. I believe the best you can hope for is to fuel their desire to not only keep learning but to take a real interest in the countries where English is the first language. I think this is such an important point because language in isolation is really meaningless. Language requires a country and countries are made up of people with their particular ways and habits. Introducing customs, traditions, sports, games and idiosyncrasies of English-speaking people into a language lesson will bring the lesson to life and grab the attention of the students. So this is a brief account of my experience of teaching oral English in China but what about your experiences as a student being taught by a native speaker? I’d love to hear from you; whether your account is good or bad. Perhaps even if you’ve been taught by me? Let me know what you thought – good or bad! Without communication, there is no life. 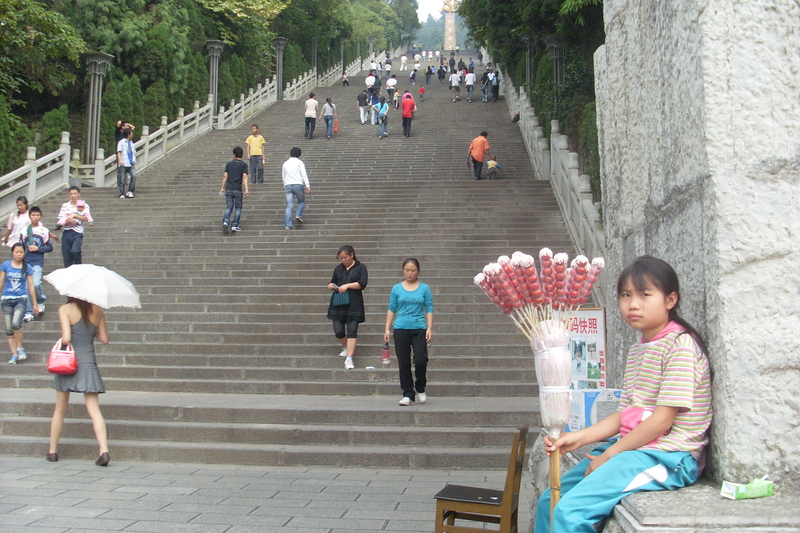 Red Army Mountain, Zunyi - 335 steps!! I have been living and working in China for over two and a half years and by far the most difficult part was not being able to communicate with other people. However, at the beginning it didn’t really matter too much because I had my new wife (now my ex-wife) to do all the communicating for me; she is a local girl from Zunyi but as time wore on, I began to get lonelier and lonelier. Now of course, at this early stage I should have started learning Chinese but I didn’t. From time to time my wife would try to teach me some words but often ended up laughing at my attempts and so I never got into it seriously. After being here two months, I started teaching oral English at Hangtian Middle School (Aerospace School) but most of the teachers kept away from me and so I didn’t make any new friends. In hindsight I feel that many of them were not confident in speaking English and perhaps did not wish to ‘lose face’ by not speaking well to me. Of course the students were delighted to talk with me as best they could and some wanted to be my friends but as any teacher will know, you can’t really be a close friend with a student; at least not on the same level as you can be with an adult. Because of this I remained without friends and anyone to talk to; so life got even more difficult for me. Now I need to point out that Zunyi where I have lived all this time is a classed as a small city with a population of over a million living in the actual city. And working in this city, there were only around ten or twelve foreigners. There were of course no western bars and as I couldn’t sing Chinese karaoke or play mah-jong, I did not develop a real social life. I did manage to make friends with one American guy and we socialised from time to time, and he too was struggling to learn Chinese. As time went by I felt even more isolated. I felt that people were very cold toward me (no one ever seemed to smile) and this was not helped by the fact that I was not accepted by my wife’s parents who would have nothing to do with me because I was a foreigner. I did not feel comfortable living in China because I felt invisible and so often I wanted to return home for good. From time to time I thought about learning Chinese but the prospect seemed all too much because the language was so difficult for me and I had no proper teacher. One Chinese person offered to teach me but she was not a proper teacher and it came to nothing. The truth is I didn’t feel motivated to learn because I wasn’t happy here. I knew it would take many years for me to be able to communicate effectively and make friends with locals and because I felt I didn’t want to stay, what was the point? Being so isolated here put a strain on my married life and small cracks began to show. I was desperate to see my family and went home during the winter and summer holidays but even this did not seem enough for me. Can you believe that in two years of living here, I didn’t have one Chinese friend? Strangely enough, it wasn’t until I was on my own again that I began to find Chinese friends, mostly English college students, who were all too willing to speak to me in English. At the time of writing, I have been living in Zunyi for two and a half years and now have quite a lot Chinese friends, and life seems almost normal. My dilemma now however, is that I must go home in the summer. The reason for this is that my daughter and my son never wanted me to come to China in the first place and were not happy with my decision. Even though they are adults and have families of their own, I know they want me home and so home I must go. As you know, family is very important! But I will be leaving behind so many kind friends now. China’s heart has finally opened up to me but now I must go. There will be some sad farewells I am sure. I hope I can come back to China some day and renew old friendships or make new ones. So that is a brief account of my life in China so far. At times it has felt that I had lost over two years of my life and worse than that I would have to start a new life again back in England. I gave up my home, my friends, my car, motorcycle and hobbies etc. to come here, now I will have to start over. However, living in China despite all its difficulties has been a wonderful part of my life and I don’t really regret the time here, I just hope I can come back sometime. Have you got any suggestions for me?